Sitting is more dangerous than smoking… is more treacherous than parachuting. We are sitting ourselves to death. More than half of the American population suffers from chronic or recurring pain, and the leading expressions of this discomfort are headache and back and neck pain. 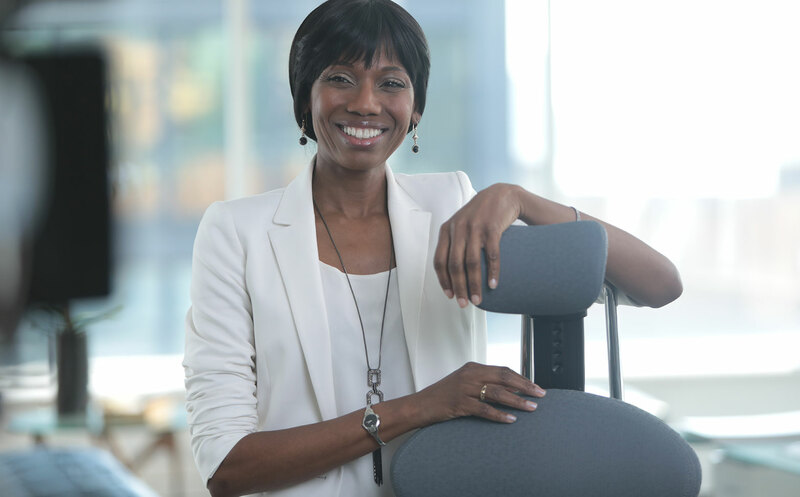 Correspondingly, the way we spend the majority of our day — at work, sedentary, hunching, slouching, and working longer-than-ever hours in one-size-fits-all chairs — is known to lead to posture disorder, a major contributor to pain and fatigue. These conditions in turn result in a dramatically increased risk of serious illness. Improper seating adds up to suboptimal employee health, pain and fatigue and a dissatisfied workforce, resulting in decreased productivity. Common pain conditions in the US Workforce costs companies over $60 billion dollars a year, according to the American Academy of Pain Medicine, with back pain alone in workers 40 – 65 years of age costing over $7 billion dollars a year. Employer-sponsored gym membership discounts and company-organized walking clubs aren’t enough to counteract this threat. Companies that invest in wellness programs, including the intentional design of health-supporting physical workspaces with furniture such as Muuv, see lower costs for sick leave, worker’s comp, and disability as well as slower growth of health care expenses year-over-year. Employees working for companies with wellness programs report improved fitness, overall health and well-being, and 67% of employees say that participation in a wellness program increases their engagement in their employer’s mission and goals. At Align1 Solutions, our touchstone is your health and wellness. Aside from our Muuv offering, Align1 Business Solutions provides complete ergonomic space planning for office environments to help you activate your workspace. Greater endurance, increased motivation, improved output, less stress, better health —Align1 Business Solutions along with Muuv makes optimal performance available to you and your entire office. 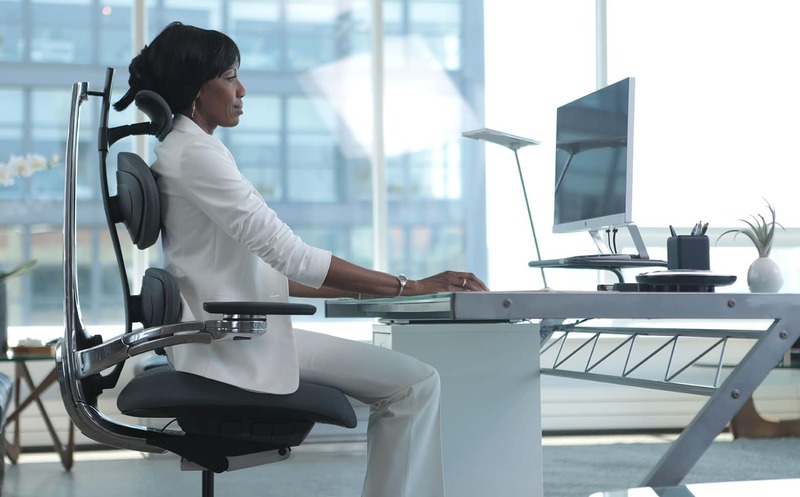 Muuv reflects a modern approach to physical ergonomics, the interaction between the human body and the environment in which it is working, by acknowledging the role of mobility in healthy sitting. 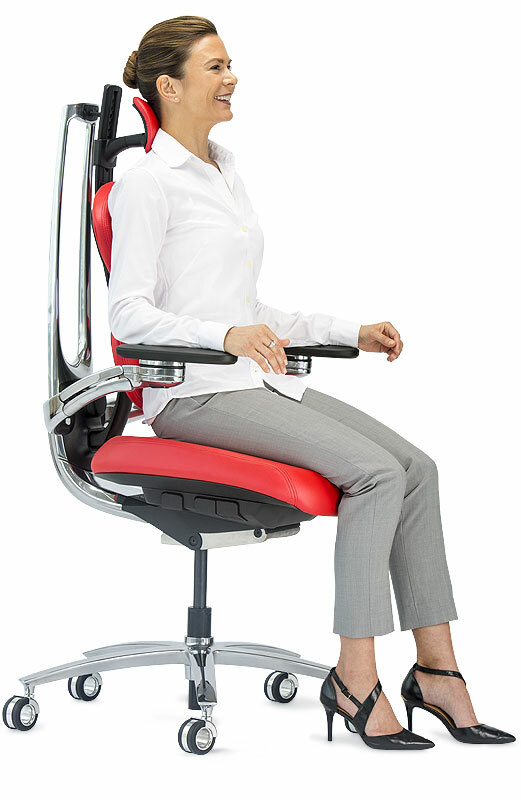 Rather than creating static, awkward postures as traditional chairs do, Muuv stabilizes your body, allowing for free and safe movement and positive, neutral spinal alignment. Termed “Dynamic Ergonomics”; Muuv’s dynamism creates an environment that meets your body’s needs for optimal health and wellbeing. Proper alignment while sitting is ears over shoulders, shoulders over hips, hips higher than knees and both feet flat on the floor or footrest. Legs should not be crossed. When you reach, bend, twist or transition to standing, hold your stomach in and think of elongating your torso. 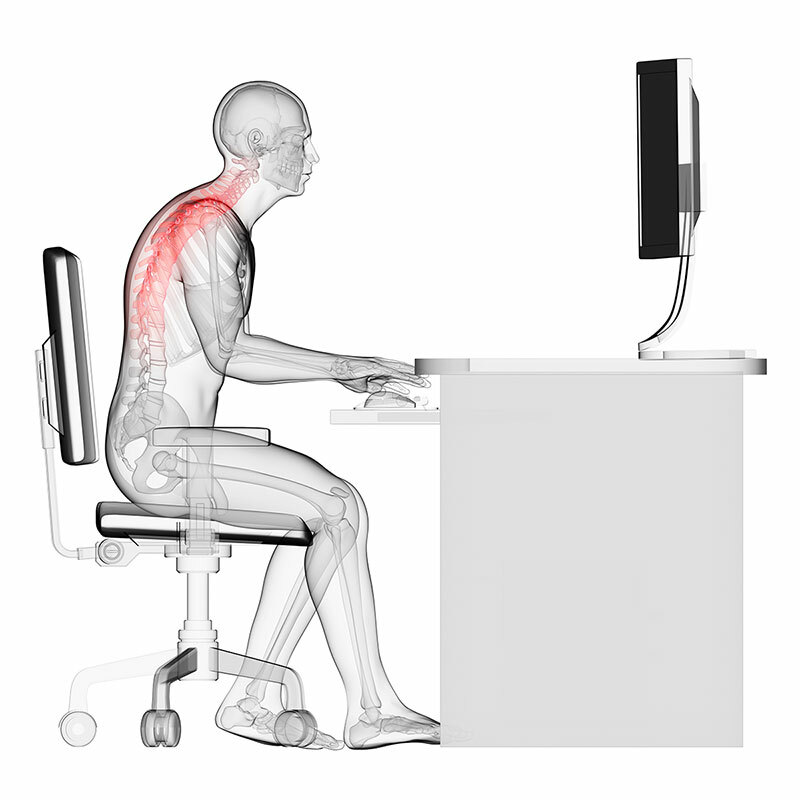 When working on desk tasks, your elbows should be slightly in front of your ribs, your arms parallel to the floor, and you should have support at your forearms and palms. 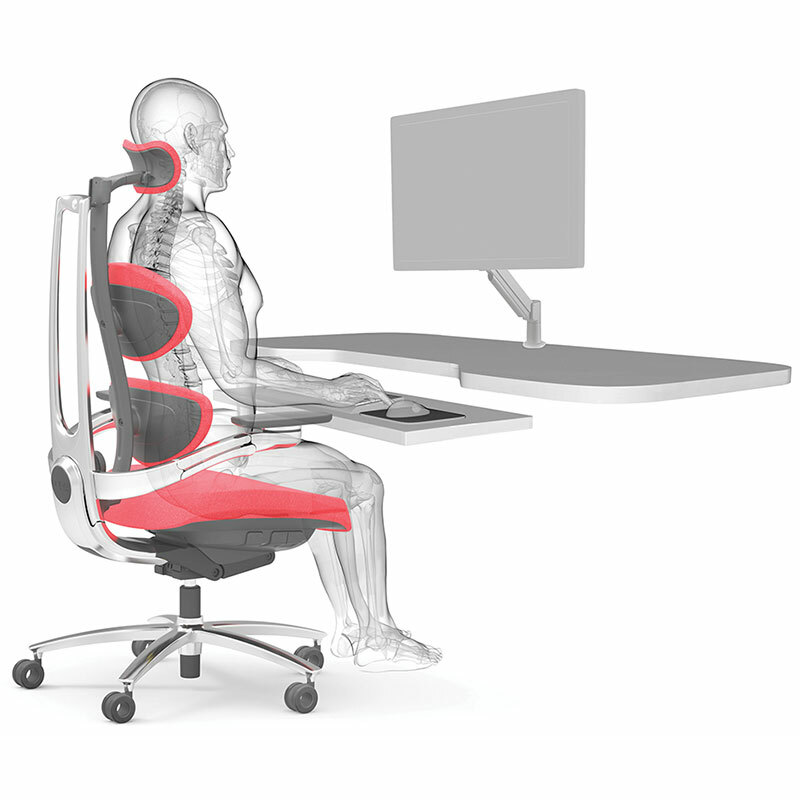 Adjust your arm pads, armrests and back support to accommodate the variety of activities you initiate each day, such as phone calls, computer-based writing and research, one-on-one conversations, and meetings. Try to avoid sitting in the same position for more than 20 minutes; in any half hour of work, strive for a ratio of 20:8:2 (20 seated minutes, 8 standing minutes, and 2 minutes of moving activity). Turn up your NEAT! Raise and lower your heels, perform small pelvic tilts and abdominal crunches, flex and extend your wrists, roll your shoulders and stretch your neck. Every bit of activity helps fuel a healthy metabolism, increase blood oxygenation and sustain energy flow. ©2019 Corecentric, LLC. All Rights Reserved.